Setup different alert notifications for each type of event. Send events via SMS, email, Slack and more. 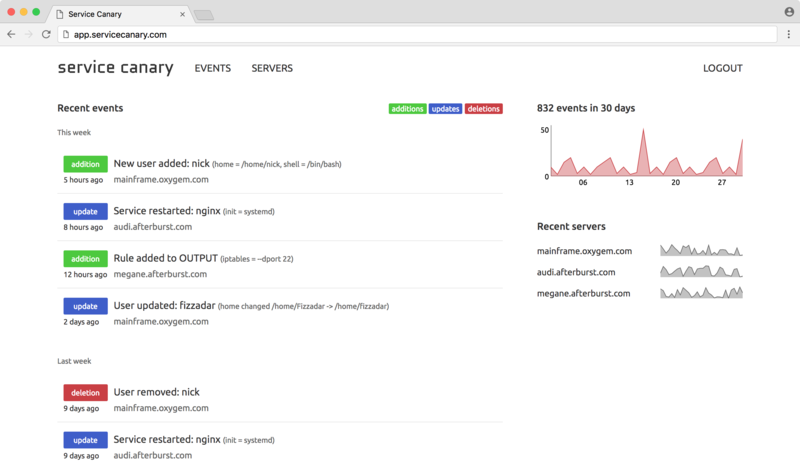 Plugins for multiple event types in an open source client & daemon. Supports Linux, BSD and macOS. Detect when users are added, removed or updated on the service. Supported everywhere. See firewall rule additions and removals. Supports iptables and firewalld. Watch for new/removed services and changes in their status. Supports SysVinit, serviced, upstart and launchd. Monitor changes to kernel versions and parameters via sysctl. Supported everywhere. See when packages are added, updated or removed. Supports apt, yum and brew. Get notified of service reboots, expected or unexpected. Supported everywhere. Detect if ports are up/down and which processes are listening to them. Supported everywhere. Watch for changes to status code/content from HTTP(s) requests. Supported everywhere.